Access routes to get to the historic districts of Albaicín and Sacromonte by car. 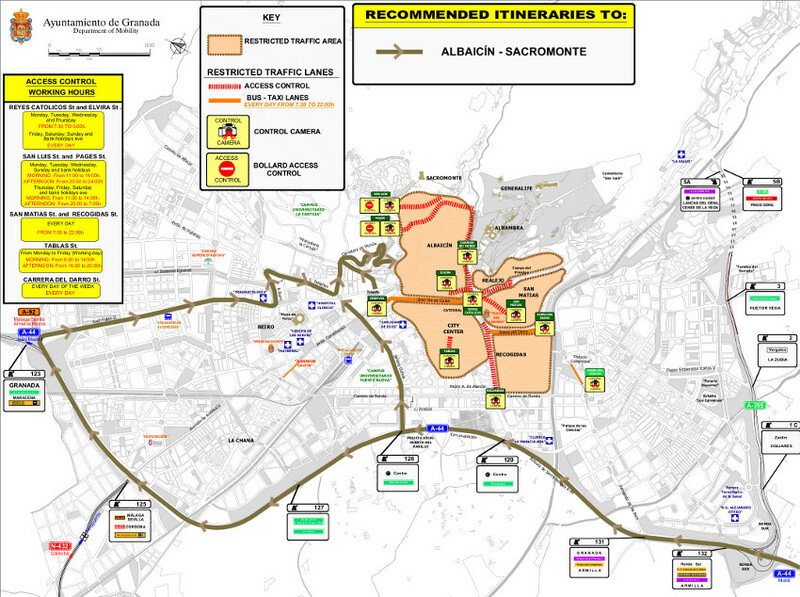 Albaicin and Sacromonte districts have traffic restrictions. Only authorized vehicles can get in to them in the access control working hours. In the following map you can see some recommended ways to get in to Albaicin and Sacromonte districs for the city visitors using their prívate vehicle arriving from A-44 (Bailén - Motril Motorway). Clicking on the previous image you can download a detailed PDF with all the information, so you can print it or check it on detail. In traffic and mobility terms, we consider Albaicin and Sacromonte districts specially protected because they are World Heritage, improving public transport and pedestrianisation. Access to Down Albaicín : Elvira St. and Reyes Católicos St., access to Plaza Nueva and the rest of the district. Access to High Albaicín and Sacromonte: Pagés St.and San Luis St., arriving from Carretera de Murcia. In the first case access control is made by number plate control cameras from 7:30 to 22:00h from Monday to Thursday when it´s not bank holiday nor bank holiday eve, and 24h for the rest of the days (Friday, Saturday, Sunday,bank holiday or bank holiday eve). In High Albaicin there are settled retractable bollards access control.Working hours are: from 11:00 to 14:00 and from 20:00 to 24:00 everyday but in the down of Friday , Saturday, Sunday, bank holiday and Bank holiday eve that changes from 24:00 to 7:00h. For further info visit Timetables in the Restricted Areas section. Check your itinerary to your destination before using the car. Check if you have to get through some access control point or bus lanes controlled by bollards or camera. If yes, ask if you can get through it or how to get an authorization. Update the maps of your GPS navigator. Get informed about your parking possibilities: on surface (a very limited parking places) or a public parking. If you need more info, you can email us to cgim@movilidadgranada.com. In many cases, the best thing to do is to park your vehicle outside the Albaicin and restricted areas and use public transport or walk to reach your destination. Public Buses lines that get to Albaicin and Sacromonte are C31 and C34. And lines N8 and N9 that circulate to Haza Grande and El Fargue through Carretera de Murcia, and from that point you can get easily on foot to Albaicín and Sacromonte. Otherwise, you can use line C32 to connect Alhambra with Albaicín.